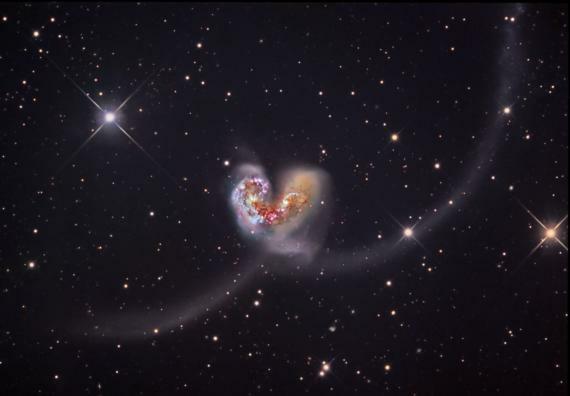 The Antennae Galaxy (sometimes called the Ringtail Galaxy) was formed by the collision of two spiral galaxies (NGC4038 and NGC4039) some 63 million light years from Earth (located in the direction of Corvus or "the Raven" constellation in the southern sky). It is surmised that an increase in the density of interstellar gas at the time of collision gave birth to countless new star clusters. This image was chosen as the APOD (Astronomy Picture of the Day) for May 7, 2007, click here to see the archived APOD.